• You are an entrepreneur with a Startup company in the gaming and entertainment field? • You want to know everything about the industry from the source? • You want to find potential investors and create beneficial contacts? If your answer to all three questions is YES, then consider yourself challenged! The companies, who accept the Gaming StartUp Challenge, will have the opportunity to present their projects in front of the audience of manufacturers, operators and experts from the global gaming and entertainment field. The jury of professionals from the industry, entrepreneurship, media, NGO sector will evaluate the contestants and choose the winner. You can register by filling the application form below not later than September 30! 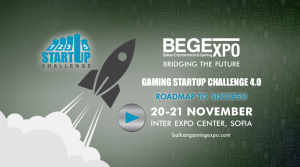 Gaming StartUp Challenge will take place at Inter Expo Center, Sofia on 20-21 November 2019.